Pajot : providing an added value for our customers. For over a century, we have been putting everything behind the quality service we offer our customers to provide them with the ultimate service. Our commercial and technical departments are at your disposal to help you make the most appropriate choice of equipment for your construction site in relation to the nature of the ground, the type and length of the profiles, the environment and the handling facilities you have available. We can also provide a pile driving predictability study carried out by a geotechnical engineer using specialist software upon request. In addition to our own PAJOT brand equipment,(pneumatic impact hammers, guardrail post pile drivers and extractors,) we are also the exclusive distributors and hirers in France of the biggest names in the sector such as PVE, DAWSON, GIKEN, DAMEN and ORTECO, as well as being suppliers of parts and equipment from brands such as DELMAG, MOVAX, ABI and MÜLLER, amongst others. Our team of qualified technicians provides breakdown cover for our equipment 24/7. When attending your site, our technicians are there to help and take care of the commissioning of the equipment you have bought or hired. They will also train your teams in operating and maintaining the pile drivers under actual conditions. We also provide pile driving training sessions on request (theory and/or practice) as well as training on preventive maintenance. Our After Sales Service (SAV) are happy to repair or service any brand of equipment at our workshops, your jobsites or your yards. 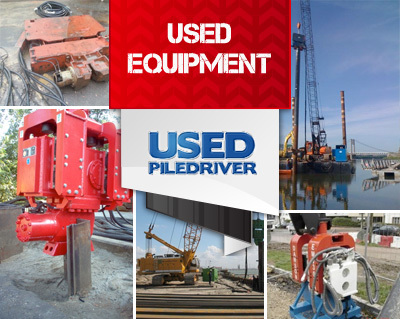 We can arrange worldwide shipping for all our equipment whether you buy it (new or used) or hire it. Our team of qualified technicians provides breakdown cover for our equipment 24/7 anywhere in the world. We carry most of the replacement parts for our range of equipment on a permanent basis either in our own workshops or those of our partners to ensure they are available within 24/48 hours.